Brutal course conditions caused many of the riders in the field to abandon mid-race. 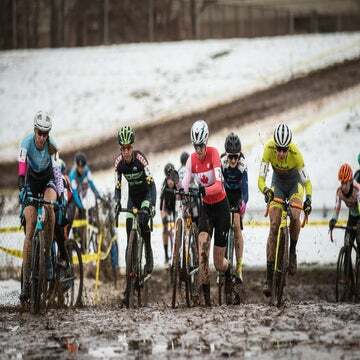 Curtis White and Rebecca Fahringer beat their respective fields — and muddy conditions in the wake of a snowstorm — on the second day of cyclocross racing at the Supercross Cup in Suffern, New York. 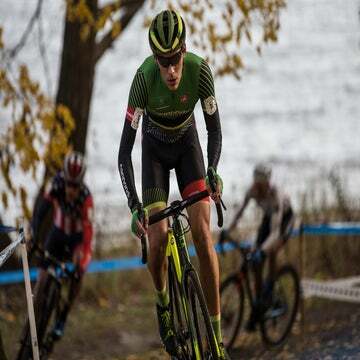 White (Cannondale-CyclocrossWorld) was victorious on both days in New York. His win Saturday occurred in several inches of melting snow. On Sunday, the course turned into a muddy mess that made for a challenging day of racing. The course conditions were so rough that just six of the 23 riders who started the elite men’s race were able to finish. White started things off by forming a two-man group at the front with Kerry Werner (Kona Maxxis Shimano). The pair rode side by side until the third lap (of eight), at which point White began to put some real estate between himself at Werner. From that point, White kept up his quick pace and held on for victory over Werner by more than two and a half minutes. Merwin Davis (Cycle-Smart), Sam Noel (UVM Cycling-Cannondale Cyclocross), and Cooper Willsey (Furman University) battled for the third spot over several laps before Davis pulled away and snagged the final podium position. “It was a lot of running today. [I was] just trying to be as smooth as you can carrying the momentum,” White said. “The first couple of laps I just tried to see what guys like Kerry and Cooper Willsey were doing, learn from their lines. Then I just gave it the diesel and gaps started opening up pretty steadily after that. Fahringer (Kona Maxxis Shimano) rode the mud at Rockland Community College to victory after finishing second on day 1 of racing. She was at the front of the race with Ruby West (Specialized-Tenspeed Hero), the winner of Saturday’s race, when she made her decisive move on lap two (of five) Sunday. Fahringer’s surge bought her 15 seconds by the end of the second lap, a gap that grew each successive time she made her way around the course. By the time she finished, Fahringer had to wait 4:06 to see West earn second. Crossing the line an additional 52 seconds was Jane Rossi (Rhode Island School of Design) in third place. West admitted that she did not have the legs to keep up with the speeding Fahringer after the latter made her move. Fifteen of the 26 women who started the race ended up finishing.